We’d love your help. Let us know what’s wrong with this preview of In The Gloaming by Alice Elliott Dark. To ask other readers questions about In The Gloaming, please sign up. Disclaimer: I know the author of this book personally, and I adore her. She was my creative writing teacher in graduate school, so even though I feel like I am going to provide a review based on the book, my feelings can't help but seep in. The book cover sets a high bar since it touts the fact that the title story, "In the Gloaming," was chosen as one of the best American short stories of century, and the title story is amazing. It is a quiet, gentle story. There is nothing overwrought about it, Disclaimer: I know the author of this book personally, and I adore her. She was my creative writing teacher in graduate school, so even though I feel like I am going to provide a review based on the book, my feelings can't help but seep in. The book cover sets a high bar since it touts the fact that the title story, "In the Gloaming," was chosen as one of the best American short stories of century, and the title story is amazing. It is a quiet, gentle story. There is nothing overwrought about it, and given the topic, that was a real possibility. Dark really captures the tenuousness of human connections in a way that makes it easy to see the miraculousness of those connections even being made or holding up at all. Coming away from the story, I felt a deep sense of how precious each little moment can be. And yes, I realize that for some this would be a good reason not to read the story, but my futile attempts to capture what makes the story fantastic should not dissuade you. Many reviewers on goodreads seemed to dismiss the rest of the collection, feeling that it didn't live up to the first, but much as I loved the first story and fantastic as it was, I found the later stories to be even better. Basically from "The Secret Spot," the sixth out of ten stories, to the end of the collection, the stories are all strong. I particularly like "Close" and "Maniacs." The only story I was less than thrilled about was "The Tower." It contains a lot to like. A lot. However, there is a plot twist that I really felt didn't serve the story. It was too shocking, felt like something too much from a soap opera. Even with the distracting twist, though, Dark manages to make something of the story by the end. Beautifully written. Dark captures the characters of Wynnemoor so that the place seems real and familiar. "In the Gloaming" is my favorite story, as it best represents the collection (hence its the title book). The story as well as the collection examines the silences that stitch lives and relationships together, revealing that in those twilight moments between what's said and unsaid we just may find ourselves. This book is named after the first short story in the book, In The Gloaming. Alice Elliott Dark, has a keen eye and a deep understanding of the inner world of her characters. This first story is about a young man who has come home to die, he is too young, the word AIDS is never mentioned, but there are enough subtle comments to know this story, first published in the New Yorker on May 3, 1993, is about AIDS. Mother and son have time 'in the gloaming,' a Scottish term for the time near the end of This book is named after the first short story in the book, In The Gloaming. Alice Elliott Dark, has a keen eye and a deep understanding of the inner world of her characters. This first story is about a young man who has come home to die, he is too young, the word AIDS is never mentioned, but there are enough subtle comments to know this story, first published in the New Yorker on May 3, 1993, is about AIDS. Mother and son have time 'in the gloaming,' a Scottish term for the time near the end of the day before the sun sets, when the sky turns purple. "Yes," the mother says, "as if all the earth was covered in heather." This piece brought me to tears. Alice Dark is a master of writing about ordinary people in not unusual circumstances, delving so deeply into the characters' lives that it takes your breath away. "In the Gloaming" is one of her best, but in all the stories we get inside the characters so that it is hard to emotionally let go when the story ends. Like a door being quietly shut in my face, hiding the life that is sure to follow, I found myself haunted at each ending. I stumbled upon this gem of a short story that needs to read by one and all... so poignant, so swift and so profound and most importantly so tragic... and most difficult to accept such incidents is that they have happened and are happening even today, as I'm typing this insufficient review..
Enjoyable collection of short stories. My two favorites were the first and last ones in the collection - "In the Gloaming" about a man dying of AIDS who lives with his parents towards the end of his life; and "Watch the Animals" about a rich woman who loves animals more than people who is dying of cancer and looking for people to take care of her menagerie. I found that each of these stories was a hit or miss for me. Some I found myself spacing out completely from boredom and some I am still going back to read. In that sense it was confusing, but when it was good it was really good and the character development was really important and honest. This book is amazing for people looking for a good collection of short stories. 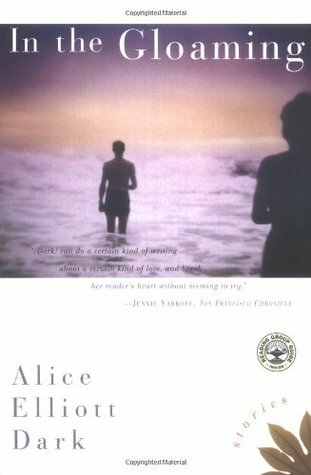 Alice Elliot Dark is great with the gripping, visceral feelings, although I would say she is more of a writer for women than men. And she's better with older women than anything else. But she does show some range and the book was a really fast read. I read this book sometime in 2000, because I liked the cover art. I was the only person I knew who hadn't seen the hbo movie version of the title story. I loved it at the time. Re-reading it, I love pieces of it -- there are beautiful moments within each story (e/g "the distraction of human love") and also painful cliches. If nothing else, read "In the Gloaming." Dark writes powerfully. Her construction of each story feels seamless with every sentence delivering on multiple levels. It is amazing how she delivers such a poignant depth of emotion with the most simple sentences. My favorite stories were "In the Gloaming", "Triage", "The Secret Spot", "Home", and "Watch the Animals". The title story is quite the two-hankie affair, and really well done. Definitely worth a read. However, I couldn't get into the rest of the collection. A lot of telling, not showing. After the laughter of two women was described as "explosive brays" and "percussive bursts" on the same page, I just kind of cringed. I read this as part of my ongoing quest to understand and conquer short stories. Some of the stories I truly loved (In the Gloaming, The Tower, The Secret Spot), some I thought were good, and a few I just didn't understand. So overall, a decent read. The author has a lovely writing style and a firm understanding of people, which was great to experience. I've read three of the ten short stories in this collection so far and can't contain myself. Every single story is a gem. Why don't more people have this book?! It's amazing! Update: I've now finished the book. It's still amazing, but the first - and title - story is without question the best of the collection. This was a wonderful collection of short stories. There was only one that I did not care for, only because it was slow going. I enjoy short stories that are character studies, and that's what this book felt like. The stories seem to have an underlying theme of loss, which makes for an interesting read. I would absolutely recommend this book to anyone and everyone. The title story may have been one of the best stories of the (last) century, but I wouldn’t say the same about the rest of the collection. “In the Gloaming” was nice and sad, but the rest were too dull, too uneven or unpolished, too full of uninteresting society ladies and queens of suburbia. Like Cheever, in a way, only more bland. The characterization was excellent and I liked how the stories didn't resolve things or come to a comfortable end...just presented a part of someone's life and their thoughts and actions during this time. To be honest, depressing short stories just make me depressed. An obvious cause and effect situation. I did get the vague idea that I should do more with my life and not settle, but at the same time I seemed to understand that everyone settles and doesn't do enough with their lives. If I wanted to know more about boring rich people I could have just taken Metro North back to Ardsley. The stories in this book go from totally awesome (In The Gloaming) to less awesome to less awesome to less awesome until the last story is like "Oh god, might as well." It was all right. I don't really remember much about the stories beyond the one the title comes from. However, I do remember that the stories were pleasant, if not particularly insightful. I did learn what gloaming means, which was nice. I commented to a friend that I liked short stories, but thought that format did not allow the characters to become fully realized. David Shuman at B&N loaned me this book to prove me wrong. And he did prove me wrong! Too much melodrama. Too many Shyamalan-esque "plot twists." Too much "she chided," "he inquired," "she hissed." Updike selected the title story for inclusion in Best American Short Stories of the Century, so I was disappointed to find this collection so uneven. "I remember being very moved by the bagpipes at your father's funeral." A powerful piece of dialogue from the masterful title story. The rest of the collection is worthy, though paler than the first story. The title story was selected one of the best short stories of the century by John Updike, but I think it is maybe the very best story ever. The other stories here hold up to the title story too -- a great, great collection. I read a really good review of this book and then went to the bookstore and saw it in the bargain section. Obviously a sign that I have to read it. Some of the stories were so-so, but the title story is so wonderful that the entire collection earns 4 stars from me.